After looking at sites in Queens and Brooklyn, a Major League Soccer franchise on Tuesday stood close to a deal to build a 28,000-seat stadium in The Bronx just south of Yankee Stadium, The Post has learned. The New York City Football Club — majority owned by the Manchester City Football Club of the Premier League in the UK — is “very, very close” to inking a deal with GAL Manufacturing, an elevator parts company, sources close to the deal said. The deal with the soccer club, which is 20 percent owned by the Yankees, will also include the not-for-profit Bronx Parking Development Company. The $400 million stadium will be located on what now is an empty lot between the Major Deegan and East 153rd Street, a source following the situation said. Mayor Bloomberg has blessed the pact. However, the team will not move forward without mayor-elect Bill de Blasio’s blessing, and he has not yet reviewed the deal, sources said. The complex deal includes the NYCFC paying for GAL to relocate. 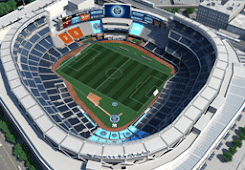 Under the proposed plan, the NYCFC will fund construction of the stadium with city-backed tax exempt bonds. The club would make pilot payments through a 35-year deal and guarantee bondholders revenues from suite sales, naming rights and the like, a source said. That is similar to the way the Yankees, Mets and Forest City Ratner recently paid for their stadiums. The new MLS team plans to start playing games during the 2015 season at Yankee Stadium. It hopes to start playing in the new digs in 2018 or 2019, the source said. Neither the Yanks nor the NYCFC could be reached for comment. Interesting. Not much new about the plan here - all of the details were outlined in the New York Times back in August - but it's interesting to hear that they might be close to a deal. There has been much made amoung fans of other teams that City wasn't held to the preferred "stadium deal must be in place" standard of MLS. The counter-argument has always been that the deal was in the works, thanks in no small part to the three years MLS spent working on it, and that the league knew an agreement was close. This would seem to bear that out. Mayor-elect Bill de Blasio will have 30 days after inauguration to ink a deal that would allow a stadium for the New York City Football Club to be built on city land — that would be rent-free for decades. Will it be a last-minute gooooal in the Bronx for the Yankees and their Middle East sheik soccer partner? City officials are scampering to sign a deal by the end of this month for $300 million in tax-free bonds that would allow the Yankees and a royal from the United Arab Emirates to tear down one of the bankrupt Yankee Stadium garages and build a Major League Soccer stadium, two sources close to the talks have told the Daily News. A draft of the agreement circulating among Economic Development Corp. staff would require Mayor-elect Bill de Blasio to decide within 30 days of his inauguration whether to approve the deal for the new soccer franchise, the New York City Football Club, the sources said. Under the complex proposal, the new soccer team — a joint venture of the Yankees and Manchester City Football Club, a British team owned by Sheik Mansour Bin Zayed Al Nahyan — would pay virtually no rent for 38 years for the largely city-owned land on which the proposed 28,000-seat soccer venue would sit. The new franchise would also be permitted to divert the property taxes it would normally owe the city to pay off its bonds, the sources said — a deal similar to the one the Yankees and the Mets got for their new stadiums in 2005. The soccer club would be exempt from sales taxes or mortgage taxes. The soccer venture would pay an estimated $25 million to bondholders of the bankrupt Bronx Parking Development firm for its E. 153rd St. garage, which sits on city-owned land. In addition, Yankees President Randy Levine is trying to buy out and relocate a nearby elevator equipment company, GAL Manufacturing Corp., which employs more than 350 workers. The soccer club needs the manufacturing site, the parking garage and an agreement by the city to permanently close E. 153rd St. for the new stadium. Levine declined Tuesday to discuss the deal or even confirm an agreement was near. But he has been busy courting the support of Bronx public officials for days. Community opposition earlier this year in Queens killed a proposed stadium for the new team in Flushing Meadows-Corona Park. With the team scheduled to begin league play in 2015, it will have to share space in Yankee Stadium until its own field is built. Mayor Bloomberg’s aides redoubled efforts in recent days to lock in a deal before de Blasio takes office. The Economic Development Corp. “is trying to get a memorandum of understanding done before Bloomberg leaves office,” one source told The News. It could still take months or years for land-use procedures and City Council reviews to be completed, but reaching a preliminary accord now could force de Blasio to take a stand quickly. The last-minute rush has sparked unease even among EDC staffers accustomed to generous deals for big companies. After all, it was the Yankees who demanded 9,000 parking spaces before agreeing to build their stadium. That led to a financial debacle when fans shunned overpriced garages. Now the garage company is bankrupt and the city is owed nearly $50 million in back rent and taxes that it will never recover. So why are city officials considering yet more subsidies to a new sports franchise controlled by the Yankees and a sheik whose family oversees more than $400 billion in oil wealth?